Croatia, Czech Republic and Spain join Israel to qualify for the September's Davis Cup semifinals. 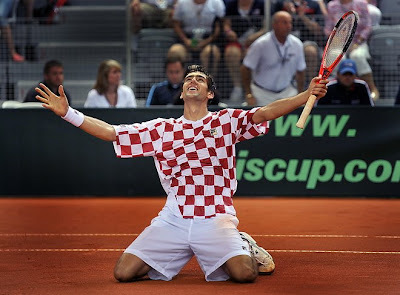 CRO-USA 3-2: The Croats remain undefeated against the Americans in Davis Cup, having now won all three meetings between the two nations. Marin Cilic wrapped up this quarterfinal tie 3-1 by defeating James Blake 6-3, 6-3, 4-6, 6-2 and setting up a meeting with the Czech Republic in September's semifinals. CZE-ARG 3-2: Juan Martin del Potro began the day by defeating Tomas Berdych 6-4, 6-4, 6-4 to put the Argentines back on level terms and send the tie to a deciding fifth rubber. But the Czechs' decision to rest Radek Stepanek in the opening singles paid off – he clinched the tie 7-6(5), 6-3, 6-2 against Juan Monaco. ESP-GER 3-2: The Germans pushed the tie into a deciding fifth rubber when Philipp Kohlschreiber prevailed 6-4, 6-2, 1-6, 2-6, 8-6 against Fernando Verdasco. Later, the experienced Juan Carlos Ferrero sealed a 6-4, 6-4, 6-4 win over Andreas Beck to send the Spanish Armada into the semifinals against Israel.